Applications to study at The University Of Melbourne are handled centrally at Faculty level in the first instance. More information on applying can be found on the Graduate School of Humanities and Social Sciences Master of Cultural Materials Conservation web page. Information for international students about Australian Government scholarships for graduate study in Australia can be found on the Scholarships to study in Australia web page. Note: these scholarships are not available to Australian students. Mid year entry is available on a full-time basis with enrolment in three compulsory subjects and one graduate elective. When selecting your graduate elective, please discuss your options with the course co-ordinator to ensure you meet the requirements for this unit. In particular they are advised to ensure they have sufficient chemistry knowledge to complete an analytical chemistry subject. You may also need to do the Chemistry Bridging subject form 9 to 13 July 2018 before your first subject in semester two. A research proposal is not required with your application. At this stage we are not asking for evidence of manual dexterity or colour vision acuity. As described above, you are asked to briefly discuss how you believe you meet these attributes in the cover letter. What is 'cultural materials conservation'? 'Cultural materials conservation' refers to the conservation (or restoration, as it is sometimes known) of works or items of cultural, historical or scientific significance. Conservation isn't just about restoring paintings - thisis probably the most widely publicised aspect of conservation, but it is an image that doesn't convey the breadth of work that conservators actually do. The term "cultural material" refers to all types of objects, made by humans in every form of endeavour. It encompasses all items of historic, aesthetic, scientific, sentimental and monetary value. The conservators at this University have worked on pieces ranging from architectural drawings, tapestries, oil paintings, old or rare books and manuscripts, architectural interiors, Greek antiquities, photographs, and some interesting museum pieces such as a stuffed polar bear. Conservators are concerned with the long-term preservation of cultural heritage material. In everyday practice they apply conservation technologies in order to preserve material objects - be they paintings, textiles, ceramics or old boots - as long as they're significant in some way! But they also strive to understand the role cultural material plays in the growth of social capital and community identity - it is about preserving themeaning as well as the physical object. Day-to-day conservation work involves the scientific and technical detail of conserving pieces, and inherent in this work is a much broader awareness of the philosophical, intellectual and scientific aspects of professional practice. What kind of career outcomes are there after studying conservation? Students who complete courses at the Grimwade Centre for Cultural Materials Conservation generally go on to work in museums, galleries, libraries, archives, archeological sites, and many other specialist areas. 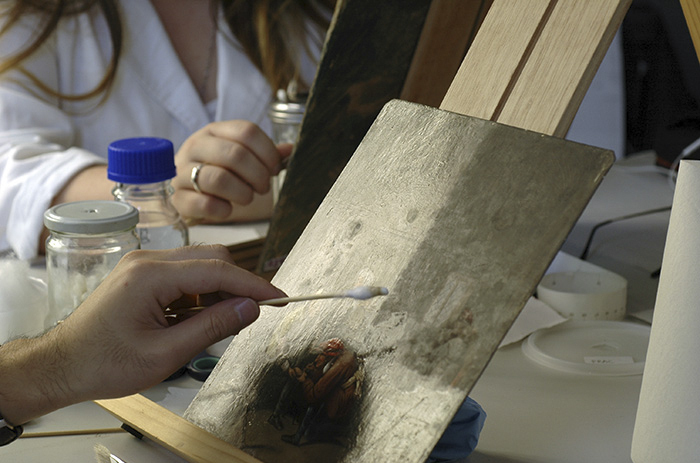 Conservators generally specialise in certain areas, ie. paper, paintings, objects. I'm an art history graduate and I don't have much chemistry knowledge. Is there a course I can do to catch up? A Chemistry Bridging course may be run on demand for applicants who don't have the chemistry prerequisite. This course will only be offered if there is sufficient demand. Email Dr Petronella Nel to register your interest. All applications and enrolments are coordinated by the Graduate School of Humanities and Social Sciences. If you have any queries, please contact the Academic Programs Manager in The School of Historical and Philosophical Studies. The Grimwade Centre for Cultural Materials Conservsation is part of the School of Historical and Philosophical Studies.